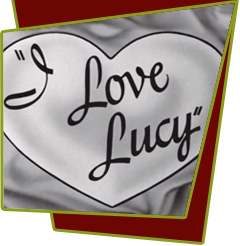 When Lucy learns of a housewife who made a fortune by writing a novel, she decides to do likewise. Much to their collective dismay, Ricky and the Mertzes discover that Lucy has incorporated in her book bits about them, and they begin a frantic search for the manuscript, finally finding it hidden in a window shade. Entitled "Real Gone with the Wind," the story boasts such characters as Nicky Nicardo and Fred and Ethel Nurtz, whose characteristics are a little too true to life. The three "critics" take drastic action by burning the book. When Lucy returns from a shopping jaunt, she notes the fire. Ethel: "Nothing like a good book and a roaring fire." Ricky: "You mean, nothing like a good book in a roaring fire." Ethel suggests a new title - "Forever Ember." However, Lucy has taken precautions and surprises them by producing three carbon copies. When a hundred-dollar advance arrives from a publisher, Dorrance & Company, Lucy wastes no time in beginning a sequel, "Sugar Cane Mutiny". In the midst of the second effort, she learns that the publisher has made a mistake, they don't want her novel after all. Dramatically, Lucy says: "I can't cry, this is deeper than tears. Sorry, Book-of-the-Month you had your chance, Bennett Cerf." When Mr. Dorrance phones Lucy a few days later, he suggests she contact Mel Eaton, who might be interested in her literary efforts. Eaton is interested. He wants to include her work in his new book, "How to Write a Novel" in the chapter titled "Don't Let This Happen to You."